The lighthouse route near Peggys Cove in Nova Scotia, Canada is beautiful in autumn with bright red wildflowers and granite rocks covering the landscape. Large granite boulders and rocks are what makes up the intriguing landscape on the lighthouse route near Peggy's Cove in Nova Scotia, Canada. 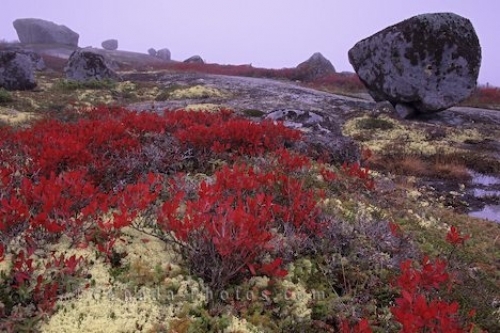 Autumn is one of the prettiest seasons in Nova Scotia when beautiful colors sprout up everywhere and on this route they mask the granite rocks and tranquility fills the air. Picture of the landscape made up of granite rocks, flowers and greenery near Peggy's Cove in Nova Scotia, Canada.